I had some space left on a PCB panel I was ordering so I quickly whipped up a return loss meter based on an AD8319 logarithmic detector from Analog devices. 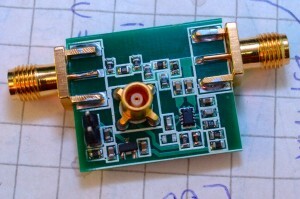 The AD8319 is specified up to 10GHz. The circuit has a 10dB attenuator and a resistive SWR bridge which output is measured (differentially) with the log detector. The circuit is laid out on 0.8mm FR4 PCB with impedance matched microstrip transmission lines. It basically gives an output signal in relation to the power difference between the input power and the reflected power. So with this meter you need to know the actual input power. You can measure the input power by leaving the output port open so all the power is reflected back and the voltage output from the log detector is directly related to the input power. Since the circuit has a resistive SWR bridge it means that it will dissipate around 3/4 of the input power so the circuit is not really suitable to be left attached to anything. It’s mainly good for measuring stuff like antenna bandwidth and such. Other practical limitations of the circuit are that the detector can only tolerate +10dBm as the absolute maximum rated power. If all the input power is reflected (worst case scenario for the detector) then the detector will see about 16dB less than the input power which means an absolute maximum input of 26dBm (the resistors would start to get really hot too!). 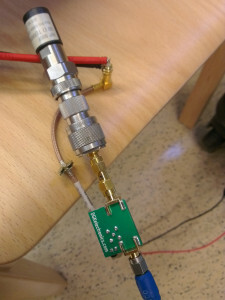 The detector will give valid readings up to around -6dBm (this depends on the frequency) after which the output starts to saturate. 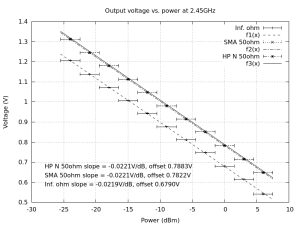 The smaller the impedance mismatch between the signal source and the load (=small SWR) the more signal strength you need to accurately measure the amount of mismatch. As you can see from the data the detector output voltage goes down as the input power goes up. Basically the return loss can be calculated from the offset between the “known” load and the “unknown” load data points. 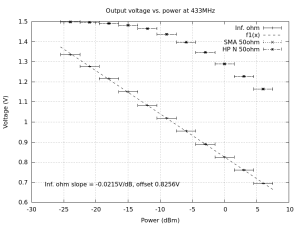 The log detector input impedance changes by quite a lot with frequency (goes down to 28ohm at 8GHz!) which starts to cause a lot of impedance mismatch. As you can see from the data the return loss (difference between a 50ohm matched load and an open load) of the bridge is far less than with lower frequencies. At 2.45GHz the return loss of the meter AND the terminator is around 5dB and at 433MHz it is 21dB which translates to an SWR of around 3.5:1 and 1.2:1. The meter is useful for smaller frequencies when the log detector input impedance is large enough to not cause a large impedance mismatch. 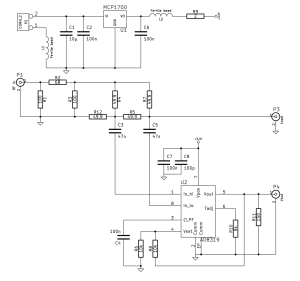 To make it more useful at higher frequencies I’d have to match the detector input. The meter would also be easier to use if it would have two detectors and a microcontroller to convert the readings to a (VSWR or return loss) value, that way you wouldn’t have to do a separate measurement of the input power and calculate the result. Maybe for version two. Me too can you sell me some? Can you sell me this? Regards.